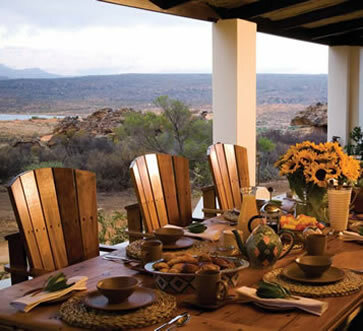 Privacy is not a luxury one expects on a family safari, but now it�s possible to book an exclusive farmhouse in the middle of a pristine reserve, which also happens to be home to one of the world�s largest open-air art galleries, set among hauntingly beautiful mountains that are millions of years old. It�s not often that we get to go back to a game reserve for a second time, but the new �Koro� Lodge, meaning �wide vista�, intrigued me. The original farmhouse, I was told, had been converted into a luxurious lodge with all the homely comforts kids could possibly require. I needed to see it to believe it and was about to discover just how perfectly planned that unlikely paradise could be. With the heady scent of orange blossom filling the air, as we descended into the fertile river plains of the Citrusdal valley on our way north to Bushmans Kloof, we were anticipating a warm, summery weekend. Our journey took us to Clanwilliam, the gateway to Namaqualand, where visitors are welcomed in their droves during the world-famous spring-flower season. That�s a time of celebration, but we visited as the flowers were beginning to fade and as Clanwilliam was focusing once again on its other marketable asset, the humble Rooibos tea. Even as we began our ascent on a dirt road over the Pakhuis pass, with its stark outcrops of reddish-brown boulders fashioned into bizarre, wind-chiselled shapes, we noticed crops of scrubby Rooibos bushes stubbornly claiming the harsh sun-baked land in between. No sooner had we reached the summit though, a chilly wind, blowing off unexpected late snowfalls down south, hit us hard and the landscape changed almost on cue. Below us, the lunar-like expanse of the valley unfolded. It was just as I remembered it from previous journeys into the almost-wild Roggeveld interior, where nothing much has changed for centuries and donkey and cart are still a respected mode of transport. We arrived in the late afternoon � my favourite time of day in this traditionally hot part of the world � with the sun�s orange glow lighting up the wrap-around verandah of the farmhouse. Nestled on a hill, with one of those endless views that has you mesmerised, and hidden far away from the main lodge, Koro still has the air of much-loved farmhouse, there long before the reserve was created in 1992. We were greeted by our personal chef, housekeeper and field guide � all of whom were to be our companions for the entire stay. Welcomed with hearty handshakes, Rooibos iced tea and a scented hand towel to freshen up after our dusty journey, we drifted indoors to the smell of a crackling fire, lit early to warm the house, as the crisp evening air that descends with clear, starry skies makes evenings jolly chilly. What followed was a speedy exploration of both master suites with four-poster beds (as kids do after being cooped up in the car � and no-one minded either) and the surround-sound, everything-you-need entertainment room across the courtyard (great for teenagers), but the kid�s loft was the big hit. Decorated with beaded baskets (full of toys) and bright Kuba cloths for bedspreads, they were smitten, and ducked in behind heavy curtains which could be drawn alongside their beds to form a tent-like space. After a short sunset game drive, and while the children frolicked in the steamy outdoor shower to warm up, our chef, Kevin Joseph, prepared dinner. His hearty lamb soup got them going (they are still asking for it today � thanks chef!) and they managed to charm their way into the hi-tech kitchen while the next course was being prepared. Fascinated by the efficient ice-maker and later enthralled by the glass cloches covering mounds of baby chocolate �clairs, muffins, tartlets and home-baked biscuits, which were set out for us when the chef left in the evening, they were convinced that this was indeed the Good Life. Dawn was still and crisp. Cup of tea and a rusk in hand, we padded outside in our slippers onto our capacious verandah, sank into comfy chairs and quietly contemplated our world beyond the rim-flow pool. But knowing that there were rock art sites surrounding the house, we headed off for a pre-breakfast walk with our field guide, Jaco Fourie. He spent ages feeding interesting snippets of information to the kids, showing them animals, lichen, footprints, spiders, flowers and restio grasses that double as paintbrushes. He peppered his anecdotes with jokes and they gave him a healthy dose of why�s and how�s in return, as we climbed the small koppie (hill or mound) above the dam. 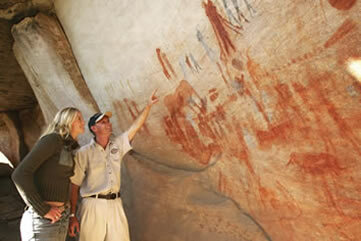 And there, under a well-protected overhang, was a pristine rock art site � literally half an hour from our front door. 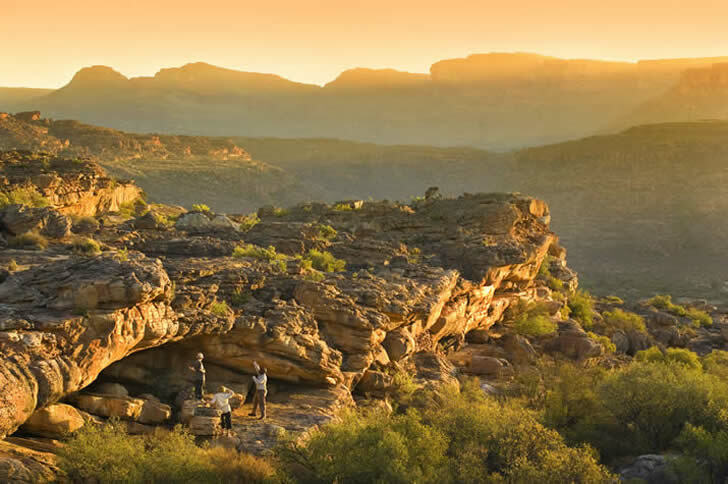 Resident archeologists will tell you that South Africa�s rich tapestry of rock art predates the most visited temples and ruins around the world. 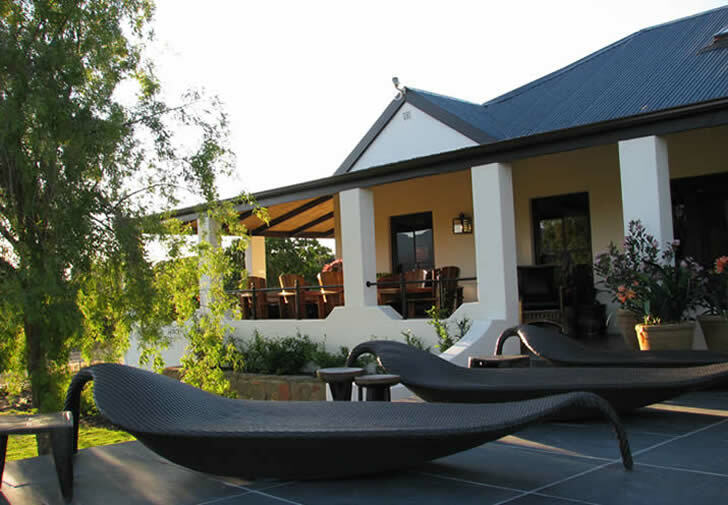 With over 130 sites, Bushmans Kloof is one of the most densely painted areas in the country. Rock art is also the oldest record of human art forms and here it depicts the culture of the San people and their spirit world � something that fascinated my kids. A legendary breakfast, followed by a game drive and picnic at one of the waterfalls on the Boontjies River - with invigorating swims in the circular potholes gouged out of the rock by the crystal clear water - exhausted us all by siesta time. 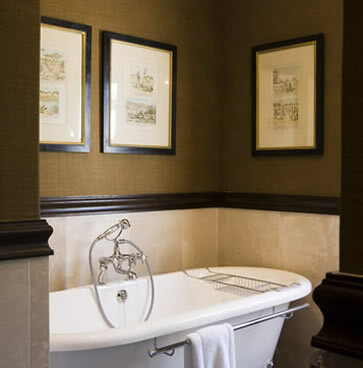 We didn�t resist, and woke again to a delicious high tea and another crackling fire. I could have made time to indulge in a spa massage or other more energetic pursuits - mountain biking or canoeing (accompanied by field guides) and even fly-fishing, croquet or archery can be organised � but this time, I was content to enjoy the pleasures of our pampered retreat and see this unique wilderness through the eyes of my children. 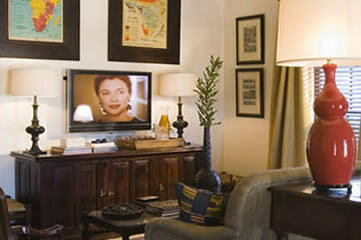 Style Luxuriously intimate lodge with a colonial farmhouse feel. 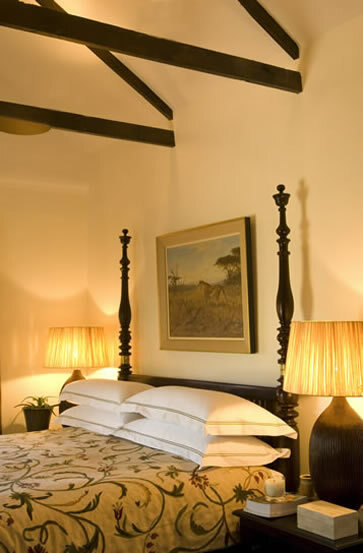 Setting In the middle of Bushmans Kloof Wilderness Reserve (a South African heritage site), with spectacular views of the bushveld but within easy reach of cosmopolitan Cape Town. Why we love it It�s the ultimate, private retreat for families with a chef, housekeeper and field guide to cater for your every need (including those of picky eaters, like my kids) but it�s also one of the few places in the world where one can still enjoy rock art without the crowds. And for clear starry nights and sunny, blue-sky days � perfect for swimming in the natural potholes in the Boontjies river that runs below the house. 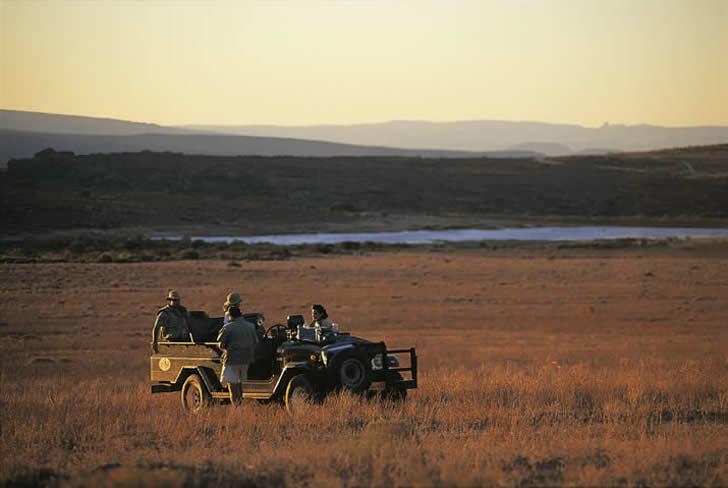 Good to know You can experience four seasons in a day � pack swimming gear, sunscreen and hats as well as woolly caps, scarves and windproof jackets for game drives. 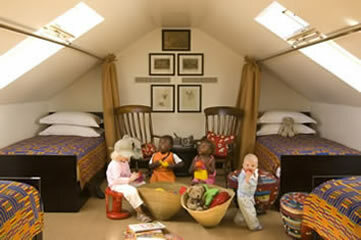 No need to bring story books or activities for the kids � their loft is stocked with beautifully illustrated African folklore and wildlife books as well as soft toys and crayons. How to get there By fixed-wing aircraft or helicopter to the private airstrip (flying time 60 minutes, with 20 minute transfer to the lodge). Or self-drive (allow three-and-a-half hours' drive from Cape Town (270km) via the Pakhuis Pass (40km) or guided road transfer (from R3 250 one way, to R6 500 return with a maximum capacity of 7 people). If you self-drive, try and find time to have a swim at the Citrusdal Hot Spring Baths on your way back to Cape Town � a real hidden gem. 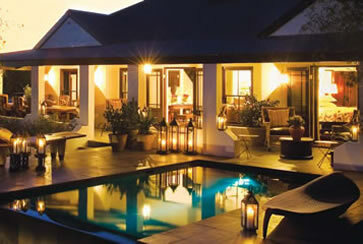 Bushmans Kloof is a Relais & Chateaux property.